Rent plastic moving boxes online; an affordable, eco-friendly cardboard box alternative. Our Ecoboxes are sturdy plastic moving boxes, ideal for moving home or offices. They’re sealable, stackable and fully recyclable. You can use them to move just about anything, including items that may be too fragile or too heavy for standard cardboard boxes. Ecoboxes are also useful as plastic storage boxes, for short or longer-term storage. Each Ecobox has a 70-litre capacity and standard dimensions of 600 x 400 x 400 mm. 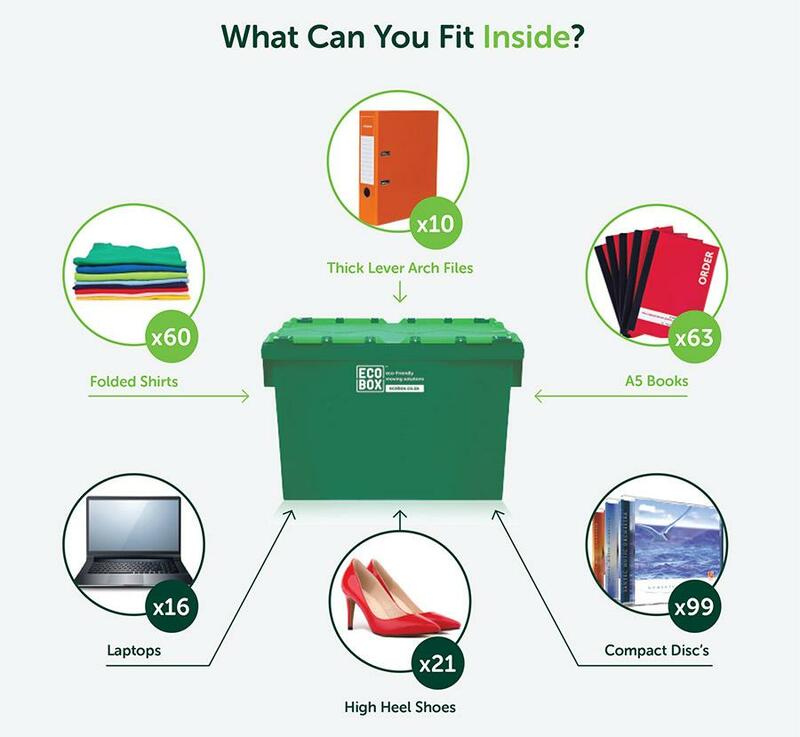 Typically, a single Ecobox can hold the contents of a small chest of drawers or, by way of example, 245 DVD cases or 120 neatly folded t-shirts. Simply order your plastic boxes for moving house or office online, and we’ll deliver them to your doorstep at a date and time you choose. Once you’ve moved and unpacked these eco-friendly boxes, we’ll collect the empty boxes from your location. Then we clean the boxes and prepare them for reuse, ensuring there’s no waste and minimising environmental impact.